This 122 page journal is a keepsake for your child’s cancer journey. Filled with inspirational drawings of our mascot “Cozy the Port-a-Cat,” the Cozy Cares Journal encourages children to draw strength from themselves and from those around them. The Cozy Cares Journal also includes word-find and drawing activities. While it is a helpful tool for the child undergoing treatment, this journal is also a cherished treasure for family and friends, who can read it and experience the cancer journey through the thoughts and words of a child. We are providing this resource FREE OF CHARGE to children with cancer. 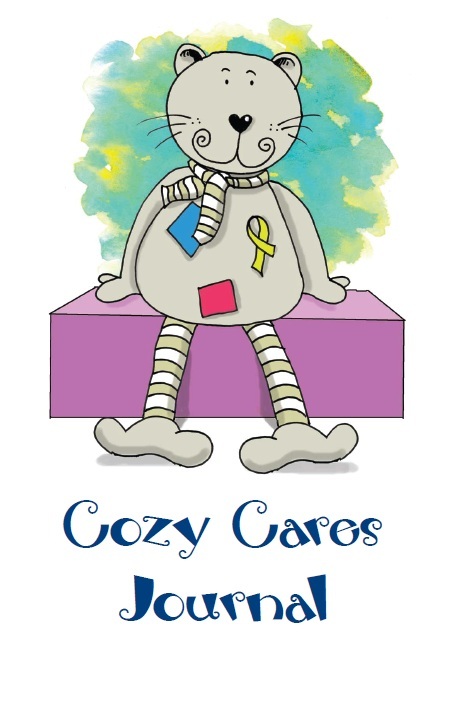 Each child will receive ONE copy of the Cozy Cares Journal and a cuddly stuffed “Cozy the Port-a-Cat” to accompany him/ her to the doctor’s office, hospital, grocery store, and everywhere in between! Please join us to raise awareness about childhood cancer… because kids can’t fight cancer alone! !